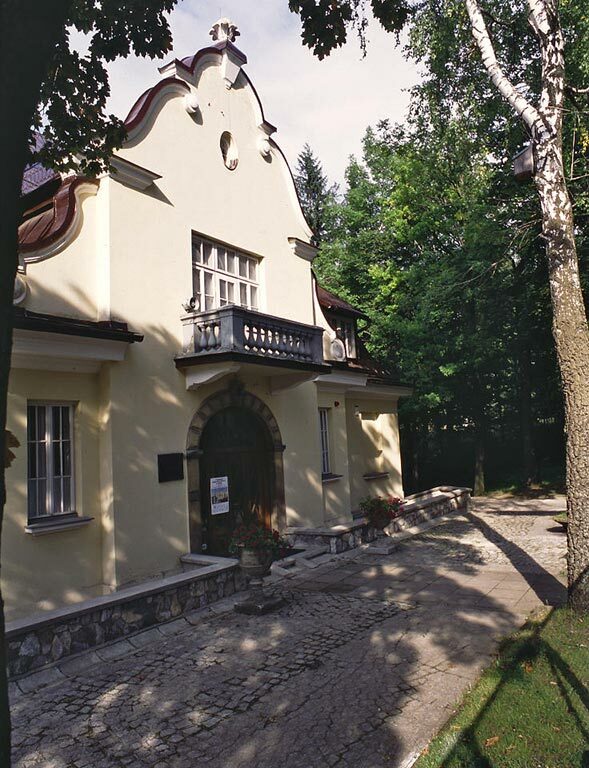 The Art Gallery, dedicated to Włodzimierz and Jerzy Kulczycki, is located in the vicinity of the famous House Pod Jedlami [Under the Firs], in a brick building in manorial style erected in the early 1920s by the Koziański family. Purchased from the family heirs by the Bureau of the Cabinet after World War II, the Koziański House served in the People’s Poland as a rep­resentative residence visited by those in power including Prime Minister Józef Cyrankiewicz, which accounts for the then popular name of the building, ‘Cyrankiewiczówka’. Following the exertions of some of the Tatra Museum staff, in 1981 the municipal authorities conveyed the building to the museum with a view to converting it into a gallery of eastern carpets of an earlier donation made by Jerzy Kulczycki’s widow, Anna Piotrowicz-Kulczycka. The collection dates back to 1906, which was when Włodzimierz Kulczycki (1862–1936), Professor and later Rector of the Veterinary Academy in Lwów [now L’viv, Ukraine] bought his first eastern carpets. His attitude towards oriental fabric and carpet collecting was from the very beginning based on scholarly foundations: he gathered the literature on carpet weaving and acquainted himself systematically with this peculiar area of the material culture of the East. He was himself the author of several works on carpets. Between the World Wars his collection was several times presented at exhibitions. His son Jerzy Kulczycki (1898–1974), Ph.D., an art historian, was likewise a passionate collector. Between the World Wars, he augmented the collection in keeping with the concept outlined by this father: it was to cover carpet weaving practised by all the nations of Asia Minor, Central Asia, Iran and the Caucasus. During World War II the collection suffered no major losses. When the repatriation of the Poles started in 1946, Kulczycki found himself in Warsaw and was for many years employed at Warsaw University. Owing its survival to many people’s help, the collection was for many years stored beneath the double-floor in the Kulczyckis’ bed-sitter. Because of Jerzy Kulczycki’s declining health the couple moved to the region of Podhale in 1964, previously resolving to divide the collection and selling part of it to Wawel Castle in Cracow. Sixty-four items, for the most part luxury ones, intended for palace use, went to Cracow. Of no lesser value, the folk carpets accompanied the Kulczyckis at Murzasichle where they had a house built. In accordance with her husband’s will, in 1977 Anna Piotrowicz-Kulczycka placed them in charge of the Tatra Museum in Zakopane as a gift to the nation.